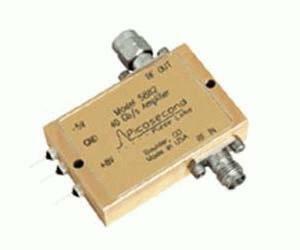 Picosecond Pulse Labs Model 5882 40 Gb/s Broadband Amplifier is designed for driving electro-absorption modulators and for use in optical receivers. It is extremely broadband, covering over 6 decades from 25 kHz to 45 GHz. It includes internal reverse voltage protection, power supply regulation and sequencing circuitry, making it insensitive to power supply voltage variation and application sequence.